Searching for some cute long distance friendship quotes and sayings. Now you don't need to search for them anymore. Here I have compiled down some of the cute and inspirational long distance friendship quotes. Hope you like the quote compilation and feel good after going through all the words. You know some friends are always there when you need them. There is nod distance too far between friends, for friendship gives wings to heart. True friends stay with you no matter the distance or time that seperates you from them. There is magic in long-distance friendships.They let you relate to other human beings in a way that goes beyond being physically together and is often more profound. I wish that you were here or that I were there, or that we were together anywhere. The road to a friend's house is never too long! Though we drifted apart in distance I still think of you as being right here. And although we have many new friends, it is our friendship that means the most to me. I just want to hug you, but your are 480 some miles away, what I wouldn't do for a hug. As we group up, we realize it becomes less important to have more friends and more important to have real ones. Promise you won't forget me, because if I thought you would, I'd never leave. Friendship lightens every burden and makes sun shine brighter. Even if you are far away, you are always close to my heart. It's good that we are far away because we learn the patient to wait for each other. If distance were measured in terms of the heart we'd never be more than a minute apart. Distance does not break off the friendship absolutely, but only the activity of it. 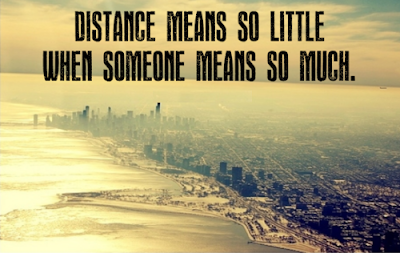 Where there is love, distance doesn't matter.